It's the new variety of rare bubble tip anemones like Inferno, Flame, Sunburst, Lemon drop, Rainbow. Where were these pretty color strains earlier and how did they come about all of a sudden, is my question. Could you throw some light in this regard? Know nothing regarding; have never encountered in the wild; though other bizarrely colored specimens that I make out as BTAs. I am working on growing my 30 gallon saltwater aquarium. I currently have 2 Percula Clownfish, 1 Engineer Goby, 4 Mini Carpet Anemone, and 2 Nassarius Snails. I want to get a Bubble-Tip Anemone eventually for the Clownfish to host with, but am also interested in urchins or sea stars. I am wondering if a Bubble-Tip is considered compatible with Blue Tuxedo Urchins or Chocolate Chip Sea Stars. Thoughts? precaution. About 2 weeks after it was added my roses turned the same bright pink color as the tube. I'm concerned the new addition has been releasing chemicals affecting the roses. 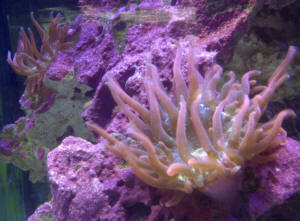 I just bought a bubble tip anemone, two actually. One is perfectly content in a little nook of a rock I could fit it in as it is very small still. The larger one was moving about, yet I bought different live rock that is more "dish" like, with a support wall to encourage it to stay put. It actually has taken to this spot, however I have noticed the last two nights it seems to stretch out. First night (before I got the live rock) it stretched from the rock it was on all the way to the other side of the tank. Seeing this I automatically went and got the rock and placed it where it had stretched to the night before. This morning I found that it was yet again stretched out upright this time towards the center of my tank (nothing there this is the free swim space) yet it isn't trying to move based on what I saw. Do you know why this is and what I can do to give it better space or keep it content in the tank? I haven't done this yet. I have been feeding it brine shrimp and ROI Fish Eggs. Could it be hungry? close to what I am seeing as I haven't gotten pictures just yet of mine personally. I appreciate, any and all help or advice. 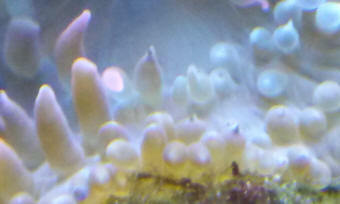 The anemone has progressively lost its "bubble" tip as seen in the pictures though. [http://www.reef2reef.com/attachments/nem_palys_13-2-2-jpg.50813/] When I bought it, only looked similar to this only green. [http://www.reef2reef.com/attachments/1417807035142-jpg.200828/] The next morning it had stretched even longer than this across the floor of my tank. [http://www.livingreefs.com/attachments/anemone-jpg.21459/] How it appeared this morning (only not as small as mine is a larger anemone). I have attached a picture of a small plate coral, Fungia, I hope. He has been a resident for about six weeks. He acclimated well, is on the sand bed and moved himself to within 6 inches of a large mushroom. You can see his skeleton receding in the area around his mouth. He eats mysis every few days. Could he be weak from the proximity of the mushroom? He moved to the current location, at this point is moving him away to<o> stressful? The tank is new, 6 months, 1.025 salinity, 0 ammonia or nitrite, 10ppm nitrate, 7.5 dKH, 400 calcium, 8.0 ph, no chemical additions. The tank parameters seem stable with weekly 10% water changes, with ro/di water. I have Kessil leds, the 160s. 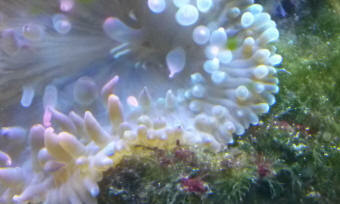 The other issue is my bubble tip anemone, he has only been in the tank for two weeks. The first week he settled and ate. After a water change he moved during the night. Next day he looks beat up, but improves his look over the last three days to normal appearance. 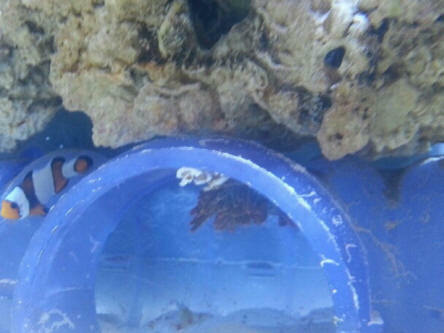 He is attached upside down(bad) in a plastic tube the fish use, no apparent access to light. Should I assist him back to a better position? he isn't damaged to look at. If it makes sense, looks like he was jostled heavily, but now the third day without light. Since he is in a man made plastic tube could he be confused, lost? Or could the anemone crab be irritating him to the point of seclusion? 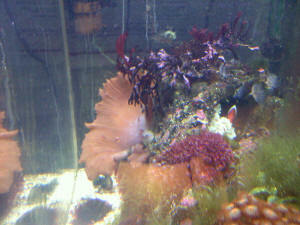 There are a couple of mushrooms and polyps on the other side of the tank, on the bottom. He was elevated on rocks. Or is there some allelopathy and he is retreating from that? Although he seemed good until the water change and any commotion in the tank seems to upset him, like feeding or algae removal. Is this a sensitivity or perhaps a weakness? Would another water change be more stressful or helpful? There is Chemi-pure in the filter. Just don't want to wait and see if something is amiss that I am not accounting for. Btw your site and Karen's anemone sight are both so informative for myself and others trying to provide for this creature. I'll continue to read. I took and attached a couple of pictures of my distressed bubble tip anemone. His color is accurate, though he doesn't seem to accept food, obviously struggling but the cause I am unsure of. Would you remove the crab? Or move the anemone at this point? Your assistance is invaluable. Thank you so much Bob for the response! If you would kindly allow me to ask a few more questions regarding the BTA, I would also very much appreciate your input. :) As I have already been researching them, I have to admit, I am timid about getting one. One reason, is coral. Once the anemone finds a comfortable and Happy spot, do they continue to travel around? Ie, daily routine, search of food, etc? Or do they pretty much stay put when they are in a good spot? Another concern, laughable as it may be... is the handling factor. How do you get the darned thing out of the acclimation bucket once it is time to put it in the tank? of a " as gently as possible" thing I just have to figure out? about BTAs splitting and reproducing quickly. This also scares me a bit and kept me from ordering or searching for one. I will continue to read up of course, but I have a very invert heavy tank and don't want them to see the anemone as a new jungle gym. I don't believe I will have any issues, however , this is what is in the tank... a fairly large thinstripe hermit(3in shell), 1 left handed zebra, 1 mexican red leg, 1 dwarf blue hermit and two electric blue hermits, a 4in coral banded shrimp, a blood fire shrimp, 2 serpent stars, bumble bee,cerith, and nassarius snails, zoanthids, eight tentacle daisy polyps, glove polyps, a couple ricordeas, 2 purple mushrooms, a ricordea yuma, the featherduster and two calcerous macroalgaes. My clowns are tank raised occilaris and they are the only two fish. I always read, and from here as well that tank raised clowns do "fine" without an anemone, and was not really concerned about it. Any ideas as to why adding an anemone in this situation specifically, might cut down aggression? <Hi Bethany. No message was included in your email. What exactly are you looking to find out? From the pic provided, I can only say that it is an E. quadricolor. 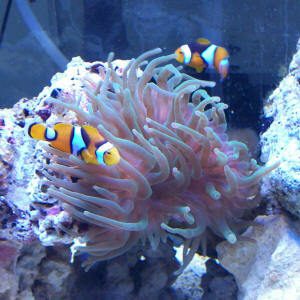 3 orange nemo clowns and a bubble tip anemone that has been in the tank for almost a year. I have a protein skimmer, two circulation and wave pumps. The anemone used to blow up near the lights and the clowns swam in it. This lasted for many months, maybe 6 months. Then it moved to the bottom of the tank, on the live rock and closed up. Sometimes it just has its bubble tips out but hasn't inflated for several weeks. Today it moved again to the back of the tank on a live rock. The clowns are still swimming around it but it is mostly closed. Haven't seen it inflated for a long time. Any suggestions on what is going on? online about 2 weeks ago and immediately acclimated it. It looked horrible (shriveled tentacles, open mouth) throughout the acclimation, but when I put it in my tank it immediately inflated and took hold just below where I put it. It's foot was shaded, and the tentacles were exposed to light. I have fed it 3 times (pea size raw table shrimp) and it immediately ate when I fed it. I went out of town for the weekend, and when I got back, the anemone wasn't in it's usual spot, and I noticed it was on the glass in the back corner of the tank, with it's tentacles still inflated. I thought maybe it was splitting but I've read many people say theirs split overnight, and mine hasn't changed much in the past 18 hours or so. I have attached two pictures of it, one from the front, and one of it's foot. Can you tell if it is splitting, or if it has a torn foot? My tank is 75 gallons with 4x54 T5HO bulbs, 2 blue plus, one purple plus, and one white (bulbs are 6 months old). I should also add that it's current position in the tank is about 6 inches below a powerhead that I immediately unplugged upon finding the anemone so close to it on the glass. I don't believe it was damaged by the powerhead, as my water is clear and the skimmate hasn't deviated from it's normal disgusting goop. I've never seen a Ritteri with bubble tips before! This particular anemone was gorgeous prior to this incident, or whatever occurred. In two weeks it kept it's bubbles the entire time. Are there any types of vitamins or anything I could "dose" the tank with to promote healing? Also, should I continue to feed it? I hope you guys have not answered this before, I read through the site and did not see anything about what I want to ask, sorry if there is already an answer. Okay time for the Question : My BTA has been in my tank for over a month now, I bought it too early, about two weeks after I set up the tank, the tank is stable now, the BTA was 2 inches when I purchased it now its 5 inches across, so its growing. It's tentacles do not have the short bulb shape it had in the pet store anymore, it kind of looks like a long tentacle anemone. I feed it shrimp weekly, I do 10 % water changes weekly, the ph is 8.0, all other parameters are okay, not perfect. Do you think there is enough light? Is shrimp a good choice for anemone food? It does have a good green color. Is there any supplements that they like? Thanks for any info, this is the best site ever ! Thank you so much for your time and wisdom :-) It helped us greatly in the following days as corals started to be affected by the chemical warfare. We went through several water changes, aggressive skimming and new carbon to help minimize the damage. In the wake, we lost a Favia (a disappointing loss- it was a fast growing specimen), two mini-colonies of Zoanthids, obviously the anemone itself, the clown and scooter blenny. Other corals were unhappy but rebounded and have all returned to their standard growth rates and the algae blenny is still fat and skittish (I really don't think he will become social again....). We allowed the tank to have several weeks of "hands off" before adding a new inhabitant. In that time, I have also seen a noticeable increase in brittle star population and some near-microscopic baby snails, along with a noticeable decline in the amount of baby abalones that were prevalent before the long tentacle mishap. I don't know if that last bit is important, but I do find it intriguing. My husband and I discussed at length what would be an intelligent addition considering what happened with the long tentacle. 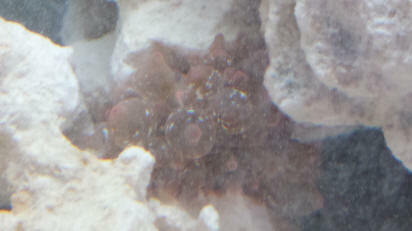 We have a good friend that has clones of a RBTA that we had purchased 4 years ago from a fellow reef club member. These clones are incredibly hardy and reproduce regularly. Fortunately, this friend is also blessed with "the cup overfloweth" with all his corals. Unfortunately, the rbtas have reached plague proportions in his 280g tank and he ends up peeling babies off the glass and putting them in his lighted sump/refugium since there is absolutely no open real estate in his main tank. We decided to ask him for an anemone, and drove 4 hours round trip to retrieve it from him. In the tank (30 gal tank, with 10 gal in sump) param.s remain constant, temp has been the only swing that has been cause for concern in the past. The temp has settled now that summer is over to a regular 79.3-ish. My husband also wanted me to clarify that the specific gravity is 1.025 (and that I shouldn't rely on the hydrometer that lives suction cupped to the side of the tank since its only good for an amphipod breeding zone). The evaporated water has an auto top off, which goes through ro/di as well as Kalkwasser before dripping into the tank. When the nem's were added they moved very little (less than an inch from where placed). At our friends they were under MH light, the lights they now live under are Ecoxotic led panorama strips-three strips, one all white, one all blue, one blue/white combo. Their homes in the tank are about 1/4 of the way from the floor, about 15 inches from the top. One of them has sunk its foot deep into a hole in the rock and retreats every night, the other has its foot on a flat rock and it balls up into a blob when the lights go out. These specimens are small, but the 12 full sized anemone's in our friend's tank are between drink coaster sized to dinner-plate sized when fully inflated. 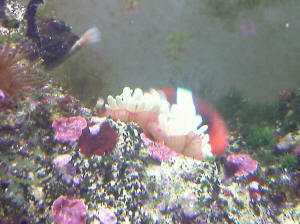 Our friend does not target feed his anemones since he doesn't wish for them to grow and reproduce any faster. I would like to add a new clown eventually, but I do not want for any over loving to injure these anemones. What feeding schedule would be appropriate for these little guys and also, what is an appropriate rate of growth for an anemone? I read on WWM that krill is not ideal for nem's (oops), but we rarely feed processed flake. The bio load of the tank now if very small with just the hermits and blenny eating algae wafers or the occasional mysis/krill/Nori/bloodworm blend sold by the LFS. Also, at what size would the nem's be large enough to be able to handle the introduction of a clown fish? I will be purchasing another tank-bred clown when it is ok to do so. I realize that as the nems grow and reproduce that I will need to remove/sell/give away clones to avoid interaction with the other coral. The rock work is set up in an effort to discourage direct interaction- the nem's each have their own "leg" of an archway set up and the flow is directed to help them choose a more appropriate direction of travel should they wander. Is there any way to help avoid chemical warfare as well? Thanks so much for your time, I'm sure that's more info than you needed for those few questions. PS I have attached a photo of the rbtas, the color looks washed out in the photo, but their color is much closer to highlighter pink. My husband bought us a marine aquarium after our months of diving in the Maldives. We have sent you pics and emails when we were discovering interesting little creatures living in our tank for IDing and your crew havenÂ´t failed us yet! We have had our tank for over a year and thought we were ready for an anemone as a gift for our Clowns. We purchased it with the rock it was attached to, as recommended by you all and selected a rose bubble tipped as they were recommended to be easier that others. It moved only once and has planted itself for about 3 weeks now in the center of the tank. It opened up after about 36 hours, (we know this as we took turns getting up in the middle of the night to make sure it didnÂ´t die or kill everything else in the tank). Our clown finally enjoyed it about one week ago. (see pic) However, today I noticed its mouth inflating, I am quite paranoid about over feeding it and now I am paranoid about it starving. Please tell me this is normal behaviour and what are the signs of both? it moved around a bit which caused me to have to move some live rock that had some pulsing xenia on it and a large blue mushroom as they were being stung by my anemone. The anemone has now moved itself to the back glass and is in between the glass and some live rock and my poor Allards clown can no longer get inside it. I was wondering if you could give me some insight into why it would have moved after being in the same spot for 3 months. every 2-3 days (my clown actually will move the pieces from its tentacles to its mouth). All my water parameters are right on the money and my salinity is between 1.025 to 1.026 which is where I was told from day one to keep it from my local LFS. Looking forward to hearing back from you guys as your advice had always proven to be helpful. oh and on another subject I have Aiptasia on a piece of live rock, I went to my LFS and they told me to use Joe's juice, however this does not seem to be killing them off whatsoever, I'm wondering if there is a better product out there that I should be using that is reef safe? Did I mention you guys are the best? Think I did. Having Bob answer a question is kind of like getting soccer tips from Pele. Digressions aside, the Heteractis anemone (certainly what he is...was, sadly) has passed to that great aquarium in the sky; no surprise as the requirements for E. quadricolor - which I could handle - and H. malu - outside my ability - are not the same. Fortunately diligent (obsessive) observation allowed me to remove him almost immediately on expiration with no change in tank parameters. New testing paraphernalia yielded good results with phosphates at unmeasurable and calcium in the high 400's. Now, the new issue. LiveAquaria, being as wonderful as they always are with customer service, has sent the correct E. quadricolor to arrive Thursday. I'm a bit worried still about the allelopathy issue that Mr.
Fenner mentioned. E. quadricolor will also violate the Geneva convention and conduct chemical warfare on his neighbors? I can try to alleviate this somewhat by overfiltering (say, a new Biowheel or an extra skimmer), a small sump or reservoir, or perhaps chemical filtration. Will any of those work out? First and foremost, thanks for what you do for this hobby. I know that what I've read here over the years I've been a novice aquarist can almost always be trusted completely as primary authority, and I thank you for the time and effort all of you spend answering questions - hopefully knowledge that your readers share with those of the opinion that goldfish are disposable pets one can keep in a wineglass, etc. My current tank is an acrylic 30 gallon tank 18 inches deep. Lighting is provided by a 130 watt Coralife Aqualight PC Daylight/Actinic unit with fresh bulbs on a 8:30-6:30 timer; filtration by a little over 35 pounds of Fiji live rock, an aragonite bed roughly 1 inch deep in the lowest areas varying by 1/2 inch upward in the deeper areas and a Red Sea Prizm skimmer (surface skimmer attachment and media box filled with carbon). I use Red Sea salt and the current parameters are Ammonia/Nitrite 0 Nitrates ~ 20ppm (working on that) at a pH of 8.3/8.4. Currently the only source of water movement besides the skimmer return is an Eheim Aquaball; within the week a second Aquaball will arrive along with test kits for kH, calcium and phosphates which I currently have no way of measuring. Also in this shipment an Instant Ocean nitrate reducer for obvious reasons. The tank has been stable at these numbers for around 6 months. Two corals are resident; a brownish leather coral that seems to be growing and thriving quite nicely and a small cluster of Zoas happily spreading near the top of the rock structure. Livestock; one Green Spotted Puffer, pride of the fleet, upgraded from skinny and worm-ridden to a healthy, club-shaped 2 3/4 inch happy specimen in the last 5 months. A bicolor blenny has been doing his part to assist the previously all-human cleanup crew necessitated by the puffer; he's new, around 3 1/2 inches in length and happily reducing the built-up algae in the tank to shreds. A tomato clown, added at the same time, fills out the fish roster at around 2 inches. Everyone gets along nicely; the clown has the GSP under control, the blenny is largely ignored by all and aside from a few hard-to-catch Aiptasia all the live rock hitchhikers are benign. Which brings us to the resident in question, a recently purchased E. quadricolor. tentacles seem to be whitish yellow and while not fully bloomed he does have them extended. The tomato clown took up residence almost immediately upon the anemone's arrival. He does seem to be feeding the anemone but I have yet to witness it actually eat anything, and the spot that it's in seems a bit dark for a photosynthetic organism. My chief concern is that the anemone has not moved from its original placement 5 days ago; I wonder if perhaps the nearly constant attention from the clown is preventing it from going where it would prefer to be in the tank. It is wedged into a deep tunnel in the rock about 6 inches down in an area that has decent flow with around 50% of its tentacles facing upward and out of the hole and the remainder in darkness. It never seems to be particularly in danger, although it can be sheepish about the lights when they first pop on. Maybe it just found exactly what it was looking for in a home, but is it possible the clown is bullying it into staying put? I have a carpet anemone in my 60gl 4 year old tank. I've had it for roughly 30-45 days. I have a maroon clown that is hosting in it. Here is what I am attempting to do. I have been running my light for 10-11 hours. Too much. I want to cut the light time down by 3-4 hours. However, I'm concerned about how much light my anemone needs. Furthermore, he has (for a number of weeks) moved underneath the rock he was originally placed on. As you can see in the attachment, it's still in an open space so it gets some light. I'm trying to gradually reduce light time and get it to where I have the light off for the morning and afternoon and turn it on around 4-10ish. Should I manually move him back to the where he faces the light directly? what do I do if he moves back under it? how will the variance in light time affect him? Knowing what I'd like to accomplish, can you help me lay out a better plan to do it? 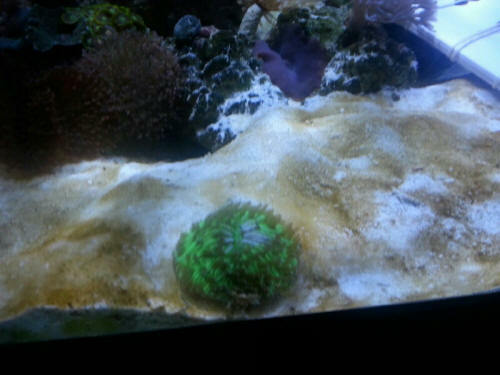 You were right..it's a green bubble anemone. Now that we know for sure the type, how does that apply to my queries below? Thanks very much for your help and patience! just to confirm, I should read the link related to carpet anemones even though I have a bubble? I have had my shiny new Red Sea Max 130D up and running for 1 month and 3 days. I added live rock in the first week of cycling and at the time I noticed a small, maroon polyp of sorts as a hitchhiker. I assumed it was a zoa of some sort and placed it under decent light to give it a chance at surviving the cycle. feeding him (her? it?) as soon as I realised with a mix of Cyclopeeze and frozen phyto, it's quite a ravenous little thing. My problem is I am unsure what to do with it now. It seems to have buried it's foot deep into the rock and the research I've done suggests damage to the foot is to be avoided. Thus I'm at a bit of a loss as to how to remove it - or indeed what to do with it if I remove it. Living up in the 'sticks' I purchase my livestock through mail order, my nearest 'LFS' is over 3 hours away. the BTA as its sole inhabitant? I suppose a bigger worry would be the inherent instability in a system that small. Any advice you could throw me would be a massive help, I'm at a bit of a loss. <You may want to read here. This morning I came downstairs and my RBTA had split! At first I thought this was a reason to celebrate but after reading your site for the last few hours to learn more I'm a little nervous. I have it in a 28 gallon Nano with LED hood. The daylights are on for about 8 hours with moonlight the rest of the time (unfortunately the actinics are broken, along with everyone else's apparently, so on backorder). He's been in there for about 6 months (the tank is 1.5 years old) with a little black ocellaris. He was the showpiece at the top center but about a month ago moved down to the side-middle of the tank. He gets pretty big throughout the day but is only fed about 3 times a month with various parts of a silverside, which I'm also reading here is not the best choice for him. What is, by the way? I know I need to pick up some Selcon but what do you feed yours? <May want to read here. My tank parameters are great, salinity at 1.023 - 1.025. This seems to be the only thing that really fluctuates and it doesn't seem that often. 25% water changes weekly and siphoning every other week. Everything else in the tank is beautiful and spreading/growing. What else...? I only have 3 fish---I did lose a fuzzy lionfish recently that refused to eat ever since he was brought home. I'm trying to think of anything that's changed and nothing really had. <Have you tried feeding the Lionfish live foods? Most will not accept prepared foods, and, your tank is too small for this fish. Have you read/researched here on this fish before purchasing? Thanks for your response. Don't know what I'd do without you guys!! I have had to change my website name to .net from .com and hope that you will be so kind as to change it on your WWM site so that everyone will be sent in the correct direction when going to my site. Thanks much, I appreciate your posting my site on your help page. <Will try my hand at the "find-replace" command on WWM. Thank you Karen. I have a simple question, I hope. (recently added x3 weeks ago). 40 lbs. LR (more to be steadily added as budget allows) Jebo 304 canister with 2 Eheim fine pads, Eheim sponge (course) pad, ceramic Bio-ring and 2 bags of activated charcoal (one under each fine pad) AquaTech 40-60 HOT Power filters with bio screens. Media is a simple filter media with Activated Charcoal in both. put it in my tank after an hour acclimation and it immediately blew around the tank. I hurriedly retrieved it to prevent it from hurting itself and placed it near my live rock. Based on the ton of info on WWM As well as on other sites, everything led me to think it would climb the rock, find its new home and move on from there. I let it alone all evening and when I went to see where it decided to call home I was surprised it had not moved one bit. It actually anchored itself to a few pieces of rubble rock on the substrate. It is 2/3's lying on substrate. Everything I read tells Me to not move it around, so at this writing, it remains on the substrate. Is this OK or dare I attempt to move it onto the rock someplace? to have eaten it immediately. did not give much. I am planning on getting some silversides this evening ten feeding a small portion to see if it will eat it then base feeding schedule from there since I have no idea when it was last fed. It appears healthy, nice green color from the zooxanthellae (due to lighting), absolutely no white and overall pinkish in color. I am not sure if lighting is adequate but I suspect not. A funny thing happened this AM right after feeding the Mysis shrimp. It literally shrank and shriveled up to almost nothing. This scared me greatly as I thought may the shrimp was still too cold and hurt it. I left it alone and after a few hours started to bubble up again. Now, almost 8 hours later, it is fully bloomed, looking content. and the type of bubble I have seems to be more of a maroon clown match. Any chance at all it could work? 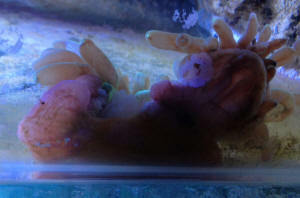 Last evening when I put it in the tank, the Ocellaris looked at it then moved away. I deliberately placed it on the side of the tank the clown seems to favor and last night after lights out the clown, for the first time ever (have had now for 3months+) actually hid inside the rock as opposed to hanging out near the front corner of the tank to rest. Why would that be? which is to be expected. I checked on him before going to bed and discovered him intertwined in the uptake for the Aquaclear refugium. and I'm not sure if this is okay. I'm also concerned about the peppermint shrimp as he doesn't seem to be compatible with anemones. I bought him to clear out some aiptasia, which he did a long time ago. I just don't want him to target the RBTA as an alternate food source. Any information or suggestions will be welcome and helpful. I'm a big fan of your website and book. Thank you very much for your response; you've confirmed my initial fears. I am going to try and keep him for a few more days and see if anything improves. and, by this morning, he has moved to the bottom of the pile and is hiding under the very bottom rock. I checked him over yesterday for any signs of distress (droopy mouth, signs of tearing), but there was none. What is this current behavior and do you still think that I should find him a new home? I appreciate the quick response and all of the resources you provide on your site. I really would like to keep the RBTA and am willing to get rid of the other cnidarians. Which would be best to remove or should I remove them all? I promise this will be the last on this matter. > > > and the linked files above." Thanks for the response and I'm sorry I wasn't understanding what you were trying to say originally. I really have been reading as much as I can, but didn't see anything about the system becoming toxic after encounters and when to remove specimens. I will remove him right away and would it be good to run activated carbon to absorb the toxic chemicals? Don't really have a question, just want to say thanks and give a picture of my healthy BTA. Your site contributes so much to the health of my pets I just wanted to share a little for a change.